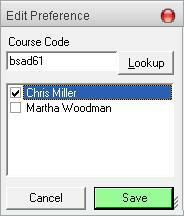 Clicking the Edit link opens a window where the user can pick a particular course and then an instructor who teaches it in the coming semester. 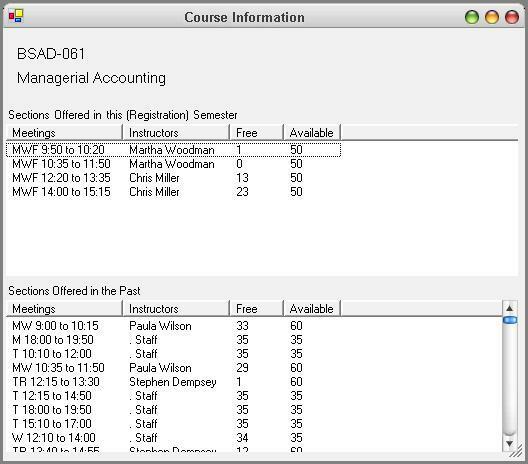 The list of instructors appears automatically as soon as the user has entered a course code. Clicking the Lookup button produces a window where the user can find a particular course. If the user doesn't know the course code he wants, he can just click the "Lookup" button and get the handy-dandy "Find a Course" window. It's similar to the regular search functionality but only offers a list of departments and courses (which may be expanded to search for courses with a particular title) and then lists only general courses offered, not specific sections. From there the user can either pick a course (to fill in its code on the Edit Preference screen) or get more details. The Course Details screen isn't complete yet, but you can see it already has the right pieces. It shows all sections currently offered for a course and all sections that have been offered in the past. This presumably will help establish which instructors might teach a certain class. If Prof. Smith always seems to teach CS-018 then there's probably no point in holding off for another instructor.